When thinking about Vermont breweries everyone thinks about Hill Farmstead and The Alchemist but Long Trail has been making quality beer since 1989. Their beers are easy to find and true to style. 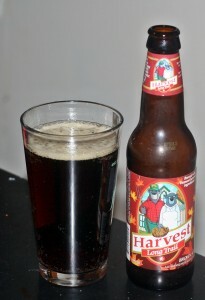 Harvest Ale is an English Brown Ale which is a style that I don’t often drink but it goes very well with a meal. Harvest pours a deep brown with only a thin tan head. Aroma has loads of roasted malts and just a bit of maple as they did use some maple syrup in the brew process. Taste has everything you expect from a brown ale, loads of caramel malts, a bit of nut and maple. Finishes slightly bitter and at 4% ABV this was a very easy drinking beer. Probably not something I would drink a lot of but if you enjoy a beer with dinner brown ales are usually a good bet. Brewers Description: In celebration of the autumn harvest we’ve brewed this brown ale with locally harvested Vermont ingredients… a truly unique Taste of Vermont™!